As an industry leader in the moving business, Corrigan Moving Systems is often called on to serve as an expert resource by national, regional and local print and broadcast media outlets. Our “In the News” page is home to our most timely, relevant media placements. Corrigan Moving Systems transported relief supplies collected by the United Methodist Churches in Michigan to their distribution center hundreds of miles away free of charge to help out victims who were impacted by Hurricanes Harvey, Irma, and Maria. 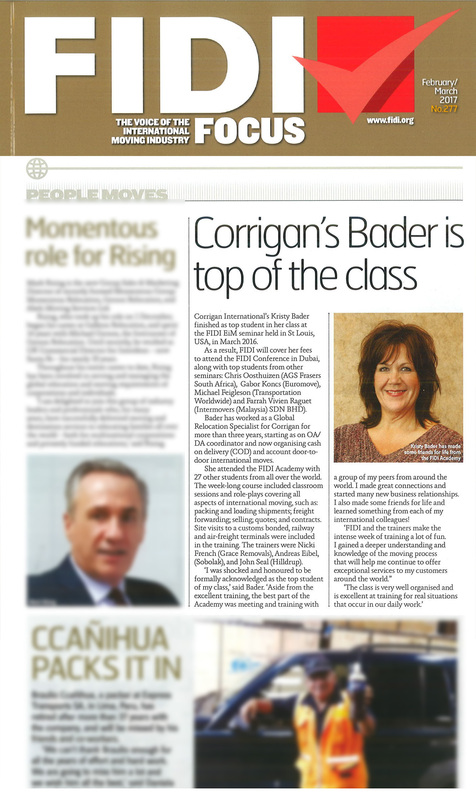 Corrigan International’s own Kristy Bader was recently featured in the February/March issue of FIDI Focus. During the FIDI Academy class she recently completed, she was the top student in her class and earned an all expense paid trip to Dubai for the upcoming FIDI convention. Corrigan driver Tom Weatherly was recently featured in a Mobility Magazine article discussing the changes we are seeing in the moving industry, and how it is affecting a variety of mobility programs. Corrigan’s movers have begun hauling more than 13 million museum specimens from the University of Michigan’s zoology, paleontology and anthropology collections to a state-of-the-art collections and research facility, a process that will take about 20 months. Crain’s Business in Cleveland recently ran an article highlighting Corrigan’s latest expansion into the Cleveland market. Corrigan has acquired the Lorain office and warehouse of Carney McNicholas. When WHEC TV in Rochester NY ran a news story about a local Rochester family whose belongings were stranded at a different moving company’s warehouse, Corrigan knew they needed to help. Corrigan reached out to the family and found a way to pick up the items from the other moving company and to transport them to Arizona. The family was extremely grateful for rescuing their move. A local Monroe MI family, whose daughter recently passed away with a rare genetic disorder, was trying to donate their daughter’s scooter to another young girl suffering from the same disorder. The scooter provides people suffering from the disorder with a much better quality of living because of the increased mobility it provides, but most insurance plans will not pay for one. The girl lives in Nova Scotia though, and the Monroe family needed help transporting the scooter the 20+ hours. Corrigan stepped in to help. WTVG 13 in Toledo covered the story. Corrigan Air & Sea’s Rick Nagrocki and Mike Murphy were called upon to co-author a bylined article, titled “Heavyweight Strategies for Moving Heavy Freight,” for Material Handling & Logistics addressing the most commonly used strategies for relocating larger and awkward pieces of equipment for overseas shipment. With extensive expertise handling shipments of this nature, Rick and Mike offered their insight into the challenges of protecting the goods being shipped and how the best relocation providers help make the move seamless. As a full-service relocation company with 85 years of experience in the field, Corrigan Moving Systems have handled a number of memorable moves. One move in particular that showcases true Corrigan Quality was when the University of Michigan enlisted our help to relocate the Ruthven Museum of Zoology’s Wet Collection, in which our crews received HazMat training to move more than 200,000 jars and tanks over a seven-month period. Recently, Director of Business Development Dan Burke connected with the American Mover & Storage Association’s Direction magazine to highlight the value of received additional certifications. As with any move, a relocation or renovation project in the student housing sector can present its own unique set of challenges to universities and property owners. Corrigan Moving Systems Director of Business Development Dan Burke addresses this growing trend toward more upscale student living quarters and offers tips to ensure a seamless moving process in an article for Student Housing Business. "I love working with you and your team. It makes my job much easier too."